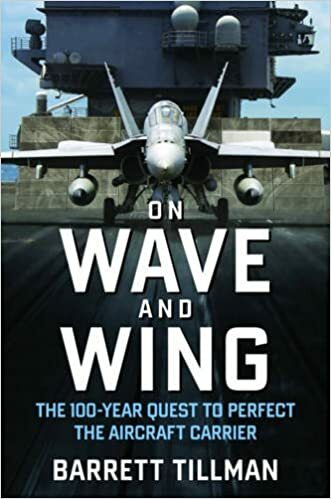 The following article on the Doolittle Raid is an excerpt from Barrett Tillman’s book On Wave and Wing: The 100 Year Quest to Perfect the Aircraft Carrier. It is available to order now at Amazon and Barnes & Noble. Though the U.S. Army and Navy had a long rivalry for funding and missions, the pressure of wartime welded them into a highly effective team for the First Special Aviation Project. History still knows it as the Doolittle Raid, America’s retaliation against homeland Japan for the Pearl Harbor attack. Ironically, the concept originated with a submariner, Captain Francis Low. While touring Virginia bases in January 1942, he saw a ship’s outline on a bombing range and conceived the notion of launching Army bombers from an aircraft carrier. He sold the concept to Admiral Ernest King, chief of naval operations, who in turn approached General Henry Arnold of the Army Air Forces. Carrier aircraft lacked the range to attack Japan and allow the ships to escape, but Army medium bombers could strike from much farther out. Arnold tossed the project to his ace troubleshooter, Lieutenant Colonel James H. Doolittle. A rare combination of hot hands and cool intellect, Jimmy Doolittle had won every air race worth entering and had earned an aeronautics Ph.D. He determined that the North American B-25 Mitchell was best suited for taking off from a carrier deck, hitting enemy cities, and escaping to safety in China. Doolittle selected crews from the most experienced B-25 unit and oversaw training on the East Coast. Coached by veteran carrier aviators, the Army fliers mastered the technique of short-field takeoffs in combat-loaded bombers. The original plan called for launching the B-25s 450 miles offshore, but on April 18 the Americans were sighted by Japanese picket boats. Consequently, Doolittle’s men began taking off two hundred miles farther east than expected, cutting deeply into their fuel reserves over China. Short of cancelling, there was no other option. 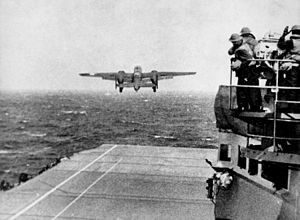 While the two carriers made a clean getaway, Doolittle led fifteen other Mitchells operating singly against objectives in the Tokyo urban area. One plane diverted to Russia, critically short of fuel, but most of the others successfully bombed their targets despite Japanese interceptors. Thirteen hours after launch, however, the returning B-25s ran out of fuel over the China coast. The crews bailed out, seeking help from friendly Chinese. Three fliers perished that night, and eight were captured by the Japanese. Four died in enemy hands; the others survived their ordeal to return in 1945. The Doolittle Raid galvanized the nation. He received the Medal of Honor and was promoted to brigadier general, en route to commanding three air forces in the Mediterranean and European Theaters. This article on the Doolittle Raid is an excerpt from Barrett Tillman’s book On Wave and Wing: The 100 Year Quest to Perfect the Aircraft Carrier. It is available to order now at Amazon and Barnes & Noble.